Shiver me timbers! That is a very Portland phrase for two reasons, first of all it’s a bit colder there than here, second of all you have the Portland Timbers soccer team (who just won the MLS Cup, well done! 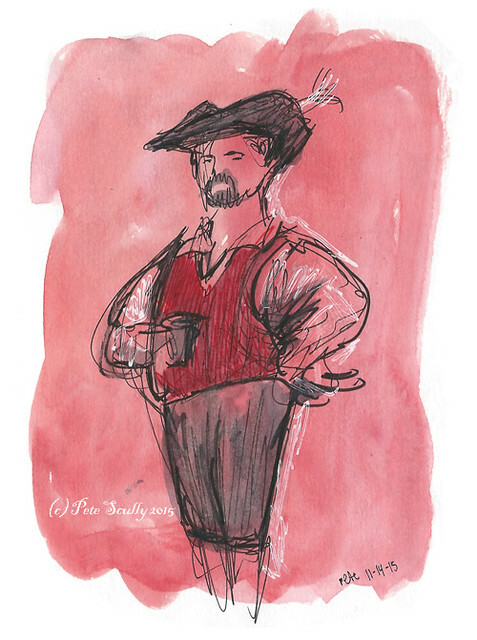 ), and third of all, PIRATES (I know I said two reasons, but I lied like a lying lily-livered landlubber). Pirates. 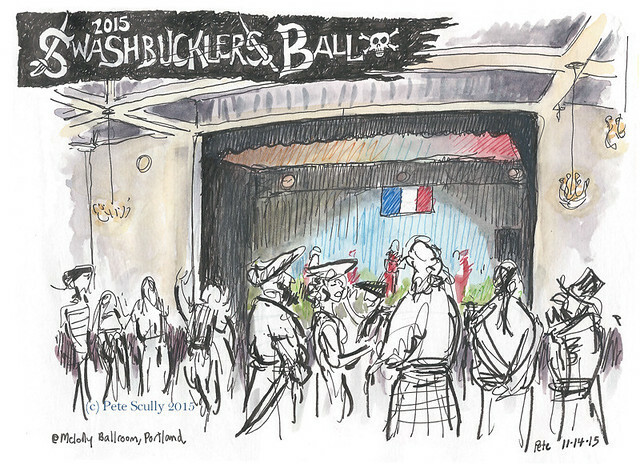 You will remember perhaps two years ago when I went to Portland for the Swashbucklers Ball, the big event where people dress up as pirates (and we’re talking seriously good pirate costumes too) and mingle with other pirates, dance to music, drink, and say “Yarr”. 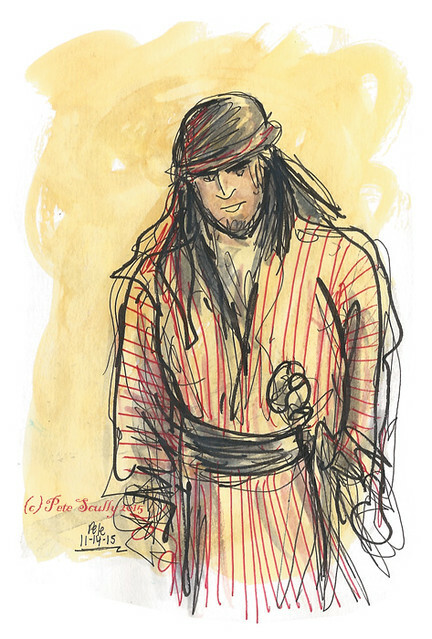 Oh, and in the case of at least two pirates, “draw other pirates” too. 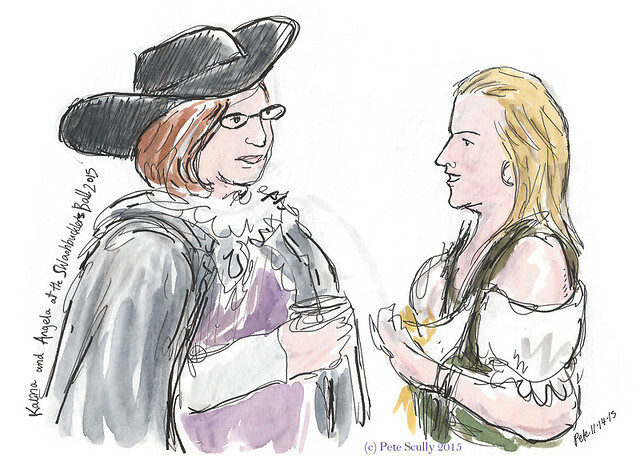 This year I went again to the Ball, this time with my wife (who doesn’t sketch pirates), and fellow sketcher and pirate Kalina, who lives in Portland. 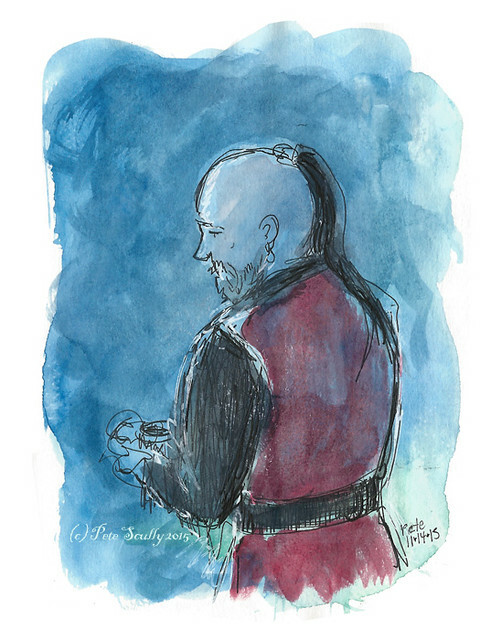 It was through sketching pirates at a Dr.Sketchy’s in 2012 with Kalina that we discovered this piratical culture of PDX, and it’s great fun. Above I sketched the Melody Ballroom while the band Chervona knocked out some tunes. The French flag flew above the stage in honour of the victims of the awful Paris attacks the day before. 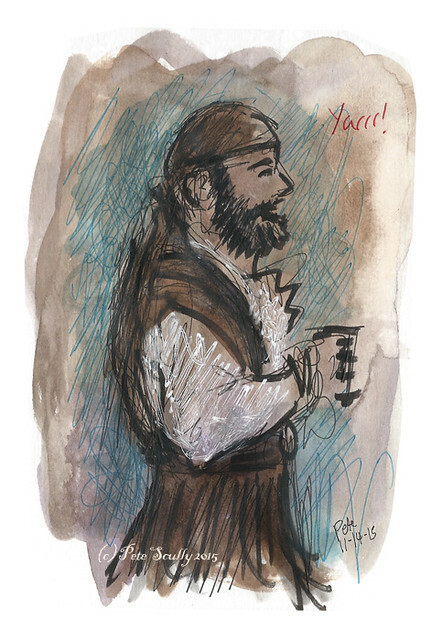 This bearded pirate (whose name was Justin) wrote “Yarrrr” on the sketch, and one of his companions had a parrot similar to mine, though with different plumage. They weren’t real parrots you understand. I loved this guy’s look, I remember him from the previous year. His hair reminded me of Balthus Dire (of Fighting Fantasy ‘Citadel of Chaos’ fame) which of course is immensely cool. I sketched this more mediterranean pirate a bit too quickly to make out the most interesting feature of his costume, the sabre with the large cobra’s head on the end. Yarr!! And that’s all I did. Gotta love the pirates.